BILLY Castle was one of the first people to congratulate his former club for winning the Cuestars club rankings. 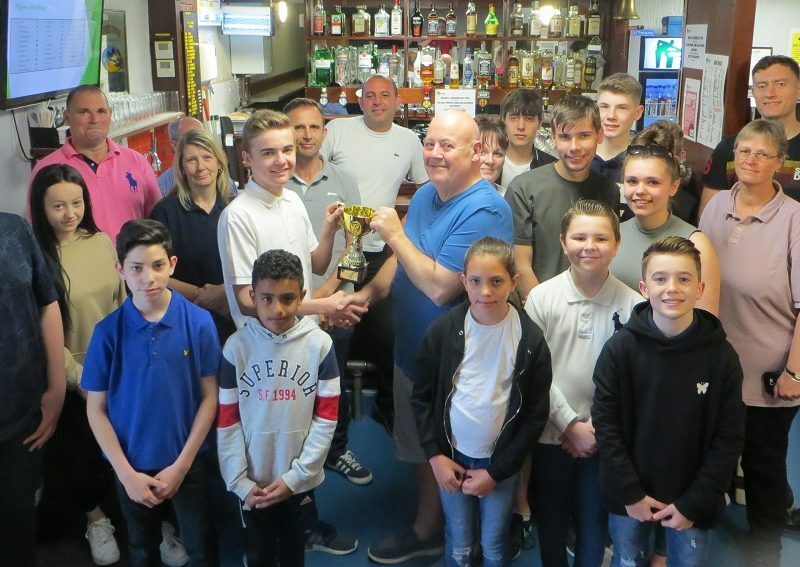 Chandlers Ford Snooker Club has topped the table for the third year running. Its 16 Cuestars players earned more than double the points collected by second-placed Waterlooville Sports Bar. The trophy is awarded to the club whose members gain the most ranking points across all five Cuestars tours: Championship, Seniors, and under-21 Gold, Silver and Bronze. Riccardo Drayton was nominated to receive the trophy from world number 114 Castle at the Cuestars finals day in Swindon. Chandlers Ford SC owner Ray Cooper, who was formally presented with the trophy by Steven Hughes in front of players and parents back at the club, said: “It’s just reward for the lads because, when it comes to hard work and hitting the practice table, they are truly dedicated to a continual improvement ethos. “Together, they religiously strive to improve, engage in competitive practice sessions and genuinely will each other on. Connor Benzey contributed the most points. The 16-year-old amassed 227 while competing on the Championship and Gold Tours. Top-ten clubs: 1, Chandlers Ford SC 2,067 pts; 2, Waterlooville Sports Bar 1,022; 3, Salisbury SC 1,005; 4, Frames Sports Bar, Coulsdon 811; 5, Woking SC 497; 6, Greenbaize SC, Bournemouth 493; 7, Churchills, Eastleigh 462; 8, Jesters SC, Swindon 382; 9, Sovereign SC, Farnborough 374; 10, The Academy, Basingstoke 296. Steven Hughes presents the Cuestars Club Rankings trophy to Chandlers Ford SC owner Ray Cooper in front of players and parents.